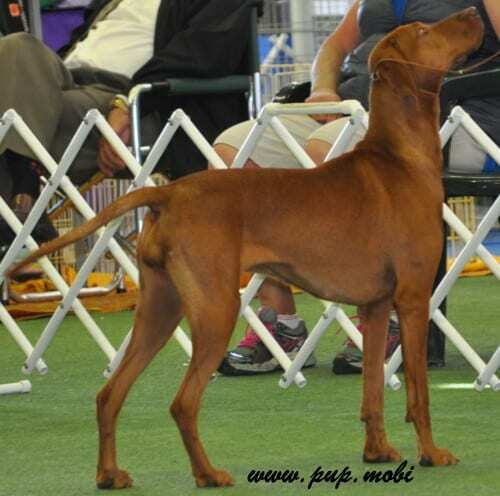 The Vizsla ( also known as the Hungarian Vizsla) was a companion and hunter for the Magyar hordes, which were a tribe who eventually settled in a country that’s now called Hungary. He appears in etchings that date back to the 10th century and was a favourite of barons of that era. He has characteristics of both a retriever and pointer. His short coat is a golden rusty colour. He’s a popular dog in show rings and in the field because of his hunting skills and the fact that he’s one of the easiest dogs to train. He’s affectionate and lively and thrives when he’s with his family. He has need of daily exercise and although his coat does shed, it only needs low daily care. He stands at 21 – 24 inches in height.